This version of the plan was developed with input and guidance from people who are currently serving in the military as well as veterans and people in veterans’ hospitals. While anyone can design and use their own WRAP, developing the plan with a supporter, in a group, or even as a family increases options and understanding. Each person will benefit from having their own copy. WRAP for Veterans and People in the Military helps those on active duty, serving in the reserves, or those retired from the military, to cope with the hardship, trauma, and loss related to military service. Upsetting feelings and experiences may be keeping them from being the way they want to be and doing the things they want to do. In addition, things may be happening in their life that are difficult to deal with. Family members and friends who don’t understand what they are experiencing or why they are behaving the way you are, may not know how to respond or how to help. Some may try to help and others may turn away. Many may feel like the situation is hopeless – that they will never feel well and enjoy life again. The Wellness Recovery Action Plan can help Vets in the process of their recovery. WRAP can assist them become who they want to be and to live the life they hope to lead. Wellness Recovery Action Plan (WRAP) For Addictions is an adaptation of the popular personal guide to developing a Wellness Recovery Action Plan. Adults and older teens who are working on recovery from addiction issues benefit from having their own copy. Agencies can purchase these books for distribution to people in WRAP groups, people who are working with a care provider on developing their WRAP, or people who are working on their own to develop a WRAP. Using the Wellness Recovery Action Plan For Addictions, self-management of addictions, as well as physical and emotional difficulties, becomes possible and practical. 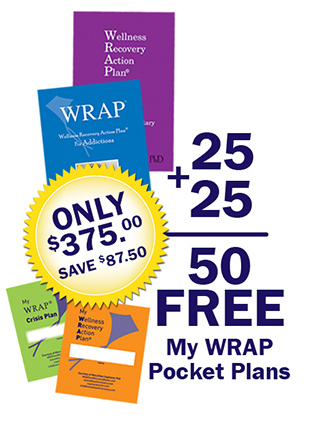 Buy 25 WRAP for Veterans and People in the Military, at the everyday discounted price of $6.00, plus 25 WRAP for Addictions at the discounted rate of $9.00 each and get 50 FREE My WRAP Pocket Guides!